Two female suicide bombers have attacked, on Wednesday 03/16/2016, a mosque in the north-eastern Nigerian city of Maiduguri, killing 22 worshippers, the army says. The first bomber struck inside the mosque, while the second blew herself up outside as survivors tried to flee, eyewitnesses told reporters. .
Eighteen other people were wounded in the attack, the army added. 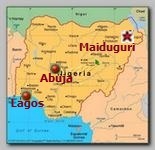 Maiduguri is the birthplace of Islamist group Boko Haram’s insurgency which has killed 20,000 people since 2009.